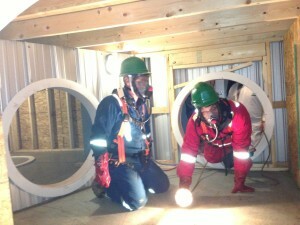 OSSA Confined Space Entry & Monitoring Training is approved by the Oil Sands Safety Association (OSSA). The objective of OSSA Confined Space Entry & Monitoring Training is to give participants an introduction to the hazards associated with entering confined spaces. A further objective is to ensure that students demonstrate a basic understanding of the methods of controlling these risks. Furthermore, the OSSA Confined Space Entry & Monitoring course covers the duties of a designated Confined Space Monitor as defined by OSSA standards. Those completing the OSSA Confined Space Entry & Monitoring Training course will be certified to work as Confined Space Monitors for Levels 1, 2 and 3 confined spaces. Another objective of the OSSA Confined Space Entry & Monitoring course is to ensure participants demonstrate proficiency in keeping track of other workers in confined spaces. A Confined Space Monitor must also be able to communicate with those the confined space, respond to an emergency in a confined space, and understand all the duties and responsibilities of a Monitor. Upon completion of this program, you will receive a wallet-size Ticket/Certificate, that will show prospective employers that you have the credentials. Employers may require confirmation of your Certificate. We keep your records on file permanently. Feel free to have your prospective employer contact METI to confirm your certification. 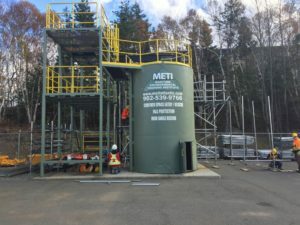 Other OSSA Training Programs Offered by METI Oil Sands Safety Training (OSSA) OSSA Confined Space Entry & Monitoring Training OSSA Fall Protection Training OSSA Fire Watch (Spark Watch) Training OSSA Elevated Work Platform Training OSSA Basic Safety Orientation (BSO) Back to our Safety Training.